It’s still three months before the first Democratic debate, nearly a year before Super Tuesday, and he hasn’t even declared yet, but poll after presidential poll continues to show 76-year-old former vice-president Joe Biden leading an enormous, diverse, and talented Democratic field. 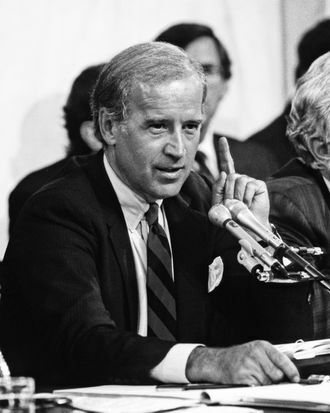 His great feminist achievement was the Violence Against Women Act, a crucial piece of legislation that Republicans remain eager to let lapse, and which is understood in many circles to have been a form of repentance for Biden’s horrifying failures regarding Anita Hill’s testimony. He works with an Obama-founded organization called “It’s On Us,” the premise of which is that it is men’s responsibility to stop sexual assault and harassment. Even in that, though, Biden is That Guy: the paternalistic lawmaker for whom it is perhaps easier to write legislation protecting women than it is to simply listen to, believe, and take seriously women, their stories of harassment, or their decisions about their own bodies and health care. Much of what Democrats blame Republicans for was enabled, quite literally, by Biden: Justices whose confirmation to the Supreme Court he rubber-stamped worked to disembowel affirmative action, collective bargaining rights, reproductive rights, voting rights. (Just look at Georgia, where curtailed voting rights may have helped Brian Kemp ascend to the governor’s mansion, where this week he praised and may soon sign a six-week abortion ban, leaving Stacey Abrams conveniently free to be Joe Biden’s imaginary running mate.) In his years in power, Biden and his party (elected thanks to a nonwhite base enfranchised in the 1960s) built the carceral state that disproportionately imprisons and disenfranchises people of color, as part of what Michelle Alexander has described as the New Jim Crow. With his failure to treat seriously claims of sexual harassment made against powerful men on their way to accruing more power (claims rooted in prohibitions that emerged from the feminist and civil-rights movements of the 1970s), Biden created a precedent that surely made it easier for accused harassers, including Donald Trump and Brett Kavanaugh, to nonetheless ascend. Economic chasms and racial wealth gaps have yawned open, in part thanks to Joe Biden’s defenses of credit card companies, his support of that odious welfare-reform bill, his eagerness to support the repeal of Glass-Steagall.